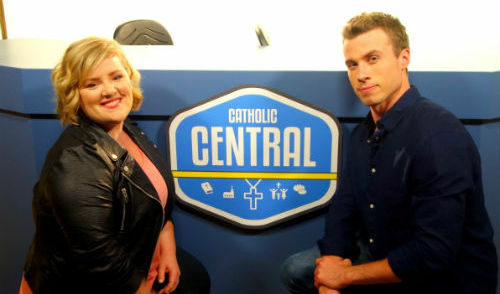 ‘Catholic Central’: Family Theater Productions Announces New Web Series for Fall! Those who stopped by our booth at this past winter’s Religious Education Congress in Anaheim met our stars, Kaiser Johnson (EWTN’s “Saints vs. Scoundrels,” The CW’s “Vampire Diaries” and Fox’s “Sleepy Hollow”) and John Paul the Great Catholic University graduate Libby Slater, and got a preview of the series. Now we’re revealing it to the world! Click on www.CatholicCentral.com to get on the mailing list for new information. HOLLYWOOD, Calif. – “Catholic Central” offers entertaining and authoritative answers to questions about Catholic thought, spirituality and practice. Family Theater Productions assembled a team of witty writers, appealing hosts and learned theologians to produce a collection of videos that entertain, enlighten and inspire. 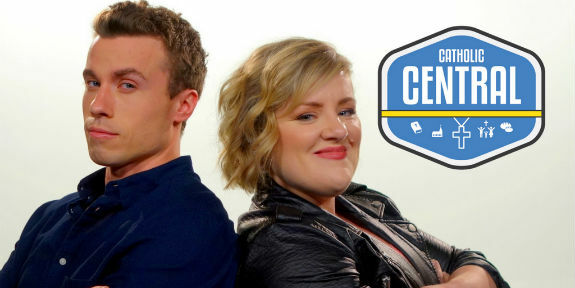 “The show hosts, Kaiser Johnson and Libby Slater, are a quirky duo that move through the content quickly and make it interesting and fun,” said Wallace. The series is produced by David Impastato and Father David Guffey, C.S.C., directed by Danny J. Boyle, and cinematography is by Steve Taylor. Catholic Central is a production of Family Theater Productions, a member ministry Holy Cross Family Ministries, founded by Servant of God Patrick Peyton in 1947. A candidate for sainthood, Father Peyton was one of the most influential American Catholic priests of the 20th century. For more information on Family Theater Productions’ media projects – www.FamilyTheater.org.